KHAN NESHIN DISTRICT, Afghanistan – More than 60 people gathered at the Khan Neshin district center for an elder’s shura, May 13. Khan Neshin District Governor Shah Mahmood addresses the attendees at a district elder’s shura here, May 13, 2012. During the shura, local elders and Marine leaders gathered to discuss future plans for the district as Afghan forces prepare to take responsibility for security in Khan Neshin. Shah Mahmood, the recently appointed governor of Khan Neshin, hosted the district chief of police Juma Khan, U.S. Marine commanders of 1st and 3rd Light Armored Reconnaissance Battalions, Lt. Col. George Schreffler and Lt. Col. Mark Clingan and more than 40 district elders, each representing various villages and tribes throughout Khan Neshin. Once greetings were out the way, often a lengthy affair in Afghan culture, the business commenced. FORWARD OPERATING BASE PASAB, Afghanistan (5/21/12) – Even on the other side of the world, the Kentucky National Guard is helping people. In the case of the Arghandab District in southern Afghanistan’s Kandahar Province, Kentucky’s Agribusiness Development Team 4 is helping empower local leaders to provide sustainable agriculture and business teaching to the area’s residents. ADT 4’s mission is the first of its type to teach agriculture and business development in the Kandahar Province of southern Afghanistan. “If we can make a small difference, it’s still going to make a huge impact here,” said Army Chief Warrant Officer Scott Goode, the Arghandab District team leader, after returning from a preliminary visit with local Arghandab officials March 25-29. KAPISA PROVINCE, Afghanistan — Women from Panjshir, Parwan, and Kapisa provinces are currently enrolled in a midwife program at the Kapisa Midwife Education Center designed to teach Afghan women the skills needed to assist expectant mothers and provide women’s healthcare education. NATO leaders, attending a two-day summit in Chicago, have solidified plans for the “irreversible transition” in Afghanistan. The final summit declaration issued Monday calls for the international community to commit to the long-term sustainment of Afghan security forces, saying funding will be guided by principles including transparency, accountability, and measures against corruption. Lieutenant General Adrian Bradshaw, Deputy Commander of the International Security Assistance Force (ISAF) in Afghanistan, here reflects on recent visits to Helmand and eastern Afghanistan, and gains made by ISAF over the past year. Last week I was on patrol with British servicemen in Helmand and, as ever, I was deeply impressed by their courage and dedication. With remarkable coolness, they remarked that the area in which we were patrolling is subject to improvised explosive device emplacement by the Taliban. The servicemen showed me where an insurgent had blown himself up trying to lay a bomb in the track just a few days before. My guides were wary of the risk, of course, and proceeded with understandable caution - but they were also confident in their drills, their equipment and their ability to stay ahead of the threat. The improvised explosive device is the weapon of choice for insurgents Afghanistan. As Staff Sgt. Brian Buckwalter reports, searching and destroying them is increasingly becoming the responsibility of Afghan national security forces. Soundbites from Staff Sgt. Gulbuddin and Sgt. Din Mohammed. FORWARD OPERATING BASE ARIAN, Afghanistan – As the American paratroopers moved carefully into the sleepy village of Ghat Kala, the Afghan troops that accompanied them were noticeably at ease. The mission’s goal was to search a kalat in the shadow of a razorback mountain for homemade explosives, the insurgency’s weapon of choice when packaged in roadside bombs. Another mud compound was purportedly owned by an insurgent commander. There might also be arms stashed in the rocky caves above the village. The Americans came in ready for a fight, but the Afghan soldiers clearly were not expecting one. CAMP LEATHERNECK, Afghanistan – The Afghan National Army assumed control of Regional Military Training Center Southwest in Helmand, Afghanistan, during an official transition ceremony Apr. 16. ANA Col. Shah Wali, commander of the Regional Military Training Center Southwest, accepts keys from Danish Army Warrant Officer Jesper during an official transition ceremony at RMTC-SW in Helmand province, Afghanistan. Coalition leaders from Regional Support Command Southwest released two training centers and a living support site, marking a small step in the bigger process of the Afghan National Security Forces running their own facilities, training and security by 2014. “That’s very good … I’m very happy,” said ANA Col. Shah Wali through an interpreter after receiving keys to the compound. COMBAT OUTPOST KOLK, Afghanistan – Locals from a small village in southern Afghanistan will see more opportunities and Afghan National Security Forces and less improvised explosive devices and Taliban thanks to a joint operation recently conducted by members of the Afghan National Civil Order Police and soldiers of 5th Battalion, 20th Infantry Regiment from Joint Base Lewis-McChord. Soldiers from 5th Battalion, 20th Infantry Regiment, Joint Base Lewis-McChord, Wash., look on as children walk past them toward a well to fetch water for the evening meal during the soldiers' participation in Operation Eagle Mountain in Didar, southern Afghanistan, recently. The operation's purpose was to clear the town of improvised explosive devices and bring U.S. and Afghan presence in the town, thereby providing local Afghans with security. The two-day mission began in the early morning hours with more than 60 ANCOP officers and American soldiers conducting foot patrols in the village of Didar and ended two days later. In those two days, the soldiers flushed the area of Taliban as well as cleared the mostly-rural village of improvised explosive devices. The operation ended with a shura, an Afghan-led and inspired meeting with village elders, and the delivery of humanitarian aid. FORWARD OPERATING BASE KUNDUZ, Afghanistan (5/14/12) – Soldiers from Headquarters and Headquarters Company, 1st Battalion, 125th Infantry Regiment, Task Force Viking, 37th Infantry Brigade Combat Team, provided assistance for an Afghan-led sheep inoculation project last week, north of the city of Kunduz. The project – which saw the inoculation of more than 20,000 sheep over two days – was a collaborative effort between the Afghan Director of Agriculture, Irrigation and Livestock, the commander of the Afghan National Civil Order Police, the U.S. advisers to ANCOP, the U.S. Department of Agriculture adviser and the Kuchi Peace Ambassador. 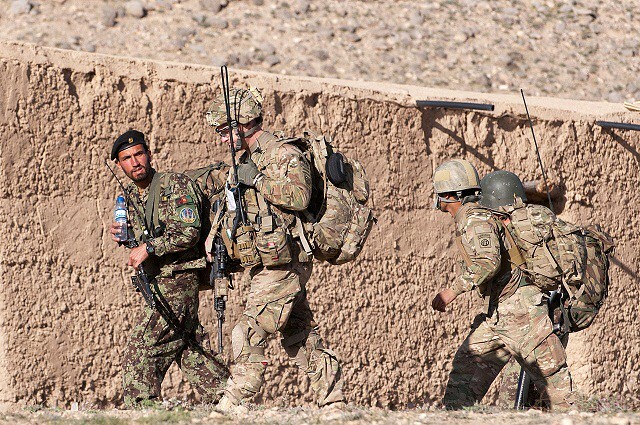 Afghan and U.S. soldiers conduct a clearing mission through Stowgan, a village in Paktiya Province, Afghanistan, to establish a presence with the locals and collect biometric data. Produced by Sgt. Rachel Badgeley. CAMP LEATHERNECK, Afghanistan — They spend time away from their families and friends; they wear the same clothes every day; they work seven days a week with no holiday breaks. Whether it is an infantryman operating in a remote area of Afghanistan who frequently engages the enemy or an administrative clerk who works in an office at Camp Leatherneck keeping track of personnel in their unit, service members who deploy to a combat zone are under a greater amount of stress than the average American. “We are all different, and we all handle stress differently,” said Master Sgt. Jackie Canaday, staff noncommissioned officer of 1st Explosive Ordnance Disposal Company, 1st Marine Logistics Group (Forward). Canaday spoke to a group of Marines and sailors during Operational Stress Control and Readiness (OSCAR) training at Camp Leatherneck, May 10. SOUTHERN HELMAND PROVINCE, Afghanistan — The Marines and Sailors of Echo Company, 2nd Battalion, 6th Marine Regiment, live minimally - to say the least - at their tiny outpost in southwestern Afghanistan. With only a dirt square outside their compound for a helicopter pad, swirling dust clouds made by helicopters landing and taking off, known as “brownouts,” make the delivery of necessary supplies, as well as troop movements in and out of the compound, dangerous for both the aircrews and ground personnel. That is where the Marines and Sailors of Marine Wing Support Squadron 273 come in. The MWSS-273 “Sweathogs” traveled to the desolate post on May 4th, to construct a safer helicopter landing zone (HLZ) with approximately 15,000 cubic meters of gravel and rock, a handful of combat engineers and only about twelve hours to complete the project. WASHINGTON, May 14, 2012 – Afghanistan will top the agenda items at the upcoming NATO Summit in Chicago as coalition members consider an agreement on a long-term strategic partnership that promotes security and stability there, NATO’s supreme allied commander for Europe reported. “What I am hoping to see is a commitment to resourcing the Afghan national security forces post-2014,” Navy Adm. James G. Stavridis said of the May 20-21 summit, which will include the 28 NATO heads of state and government representatives from many of the 50 nations that make up the International Security Assistance Force in Afghanistan. “I am fairly confident we will see that, and I think that will be the key to long-term success,” Stavridis said during an interview with the Pentagon Channel and American Forces Press Service. NATO Secretary General Anders Fogh Rasmussen considers a long-term strategic partnership with Afghanistan to be a high-level goal, Stavridis told Congress in March. Missile defense will be another major summit issue, the admiral said, with the announcement that the new missile defense system has reached interim operational capability. This interim system, the first phase of the new U.S.-based European Phased Adaptive Approach Missile Defense System, will be integrated with the NATO command-and-control system to begin standing up the NATO missile defense system, he said. Looking to the future, Stavridis said he anticipates more discussion of “smart defense” -- essentially pooling capabilities in light of shrinking defense budgets confronting all the NATO members. “As we face these financial pressures today, clearly we need to, in any alliance, come together in efficient ways so we can … generate capability for reasonable amounts of money,” he said. Stavridis, who also commands U.S. European Command, noted missile defense as an example of financial burden-sharing that provides collective defense. Another is the Baltic air policing mission, in which NATO member nations rotate their fighter jets to defend the airspace over Lithuania, Estonia and Latvia. Summit participants also will discuss progress on a new alliance ground surveillance system that will give commanders a comprehensive picture of the situation on the ground. NATO’s operation to protect civilians in Libya drove home the importance of such a system, Stavridis said. As a result, 13 allies plan to procure a variant of the Global Hawk unmanned aerial vehicle and the associated command-and-control base stations and to operate them on behalf of all NATO members, he reported. Stavridis said he hopes the members will discuss the pooling of resources in other areas such as special operations and cyber in which pooled arrangements would benefit the alliance. While not necessarily a top agenda item, the apparent inability of some NATO partners to spend 2 percent of their gross domestic product on defense as agreed is likely to come up during the summit. Only six members, including the United States, Great Britain and France, currently meet that goal. Economic and fiscal pressures have caused many European states to reduce their budgets, and Stavridis expressed concern that the situation could adversely impact military readiness. “We, the United States and its partners who are spending that amount of money, … need to keep pressure on those who are not, so they meet those minimum levels of spending,” he said. KABUL, Afghanistan, May 13, 2012 – The International Security Assistance Force welcomes the release of the Afghan government’s list of areas intended for the third stage of the transition of security responsibility in the country, officials reported today. The Afghan government will now enter the third of five tranches as they continue to move forward in the process of taking the responsibility of national security from ISAF, officials said. “President [Hamid] Karzai’s announcement of the third group of areas to enter transition is a testament to the capacity and capability of the Afghan National Security Force who will now be responsible for the security of more than 75 percent of the Afghan population.” said Marine Corps Gen. John R. Allen, ISAF commander. FORWARD OPERATING BASE GERONIMO, Afghanistan (May 7, 2012) — Afghan soldiers will add a new weapon to their arsenal, when recent graduates from a marksmanship course return to their bases. The newly trained soldiers will carry a M24 sniper rifle, a weapon recently acquired by the local kandak. The weeklong marksmanship course, taught by a Marine scout sniper team, covered maintenance of the M24 sniper rifle, firing the rifle at a distance of 450 meters, memory and observation tests. The tests require soldiers to scan a field and identify as many hidden military objects as possible, in a 30-minute time limit. “I had never used this rifle before and was excited to fire the [weapon] at the longer distances,” said Afghan National Army Gunnery Sgt. Mohammad Hasan, an academy instructor with 1st Kandak, 1st Brigade, 215th Corps. SAFAR, Afghanistan (May 4, 2012) — The meeting was ordinary but the conversation unusual. Seated on opposite sides of a stuffy room inside an Afghan elder’s dirt-walled compound, a pair of Marines and their interpreter relax among friends, sprawling out on decorative black pillows and conversing with their hosts. Members of the UK's Explosive Ordnance Disposal (EOD) and Search Task Force in Helmand are stepping back from their front line role to develop the Afghan National Army's bomb disposal capability. British advisors have been deployed to train, mentor and 'authorise-for-action' Afghan National Army Explosive Hazard Reduction Teams. The Afghan National Army soldiers complete an initial four-week course provided by US forces before graduating onto the advanced training given by British specialists. They are put through their paces by an experienced instructor pairing from EOD and Search to ensure they are confident, methodical, professional and aware of current threats. To complete the course soldiers have to pass three assessed tasks either in camp or 'live' on patrol before they can be utilised as a team. HELMAND PROVINCE, Afghanistan — Improvised explosive devices have changed the way theMarine Corps engages hostile forces. The need has risen for supplies to reach the most remote parts of Afghanistan quickly, reliably and safely. Late last year, the Corps began experimenting with the K-MAX – an unmanned helicopter, able to transport large amounts of cargo and reduce the need for convoys. With troops spread across a desolate country with few paved roads, steep mountains, rocky terrain and abrasive weather, the K-MAX has arrived to help deliver supplies across the harsh lands of Afghanistan. Presently, convoys are exposed to many potential dangers, such as improvised explosive devices and ambushes. Both have claimed the lives of Marines in the past. “The need [for an alternate transport solution] came about because the Marine Corps wanted to get trucks off the road,” said Maj. Kyle O’Connor, the detachment officer in charge for Cargo Resupply Unmanned Aircraft Systems [CRUAS], a component of Marine Unmanned Aerial Vehicle Squadron 1. The K-MAX platform has a unique configuration. The two sets of rotors are mounted side-by-side and turn in opposite directions. Each rotor on the helicopter is mounted at a slight angle to the other so that the blades can spin simultaneously without colliding. This configuration allows for superior stability and power while eliminating the need for a tail rotor. K-MAX has, thus far, fulfilled the Corps’ request of transporting large amounts of cargo over great distances in an expeditious manner. O’Connor explained that in the month of March alone, the K-MAX ferried approximately 500,000 pounds of cargo and has transported more than 1.3 million pounds since its arrival five months ago. It has flown roughly 400 missions in theater. O’Connor said the K-MAX has performed so well that the original six-month trial has been extended in theater. The data collected will give Corps officials insight on whether to keep the K-MAX as a permanent addition to the Corps’ unmanned squadrons. “We’re flying to see if there are any issues and see if problems come up,” O’Connor said. While data is being collected, new tactics, techniques and procedures have been created to weave the K-MAX into everyday operations across Helmand province. Sgt. Trevor Scarberry, an Air Vehicle Operator with CRUAS said he has helped create new procedures for the aircraft. “Since no one has done this and it’s all brand new, we’re having to develop new ways of doing things,” said Scarberry, of Choctaw, Okla. He said new procedures have been implemented for safety, landing zone and air space coordination. One such procedure ensures the safety of ground crews unloading the K-MAX once it reaches its destinations. The intermeshing duel rotors spin within a few feet of the ground and surrounding personnel must be keenly aware of the down tilt of the rotor blades. Even though the K-MAX is still in its trial run, Scarberry said he is very pleased with the performance of the aircraft. In addition to resupplying units on the ground, the K-MAX will also support the reduction of international troops. While NATO forces prepare to withdraw from Afghanistan, the K-MAX will be working alongside them. O’Connor added since February, the K-MAX has helped retrograde equipment from several combat outposts and will likely continue these types of operations in the future. A K-MAX helicopter with Marine Unmanned Aerial Vehicle Squadron 1 rests on a helipad prior to liftoff for a supply mission in Helmand province, Afghanistan, April 30. FARAH, Afghanistan — Dr. Ashraf Ghani Ahmadzai, chairman of the Islamic Republic of Afghanistan Transition Coordination Commission, met with members of Provincial Reconstruction Team Farah and local provincial leaders here today. Pictured: Dr. Ashraf Ghani Ahmadzai, chairman of the Islamic Republic of Afghanistan Transition Coordination Commission, greets Afghan National Army soldiers at Forward Operating Base Farah. U.S. Navy Cmdr. Thomas Sheppard, commanding officer of Provincial Reconstruction Team Farah, Nancy Abella, U.S. State Department representative, and Farah Provincial Governor Mohammed Akram Khpalwak welcomed Ghani and U.K. Brig. Gen. Richard Cripwell, head of transition at International Security Assistance Force Headquarters, to Forward Operating Base Farah. Smuggling operations at Fort Irwin, Calif., U.S. Army Troopers with the 11th Armored Cavalry Regiment's Horse Detachment lead pack mules loaded with simulated weaponry as training for smuggling operations at Fort Irwin, Calif., April 16, 2012. FORT IRWIN, Calif. (May 4, 2012) -- Insurgents and criminal elements in Afghanistan have shifted to smuggling for illicit funds and supplies. With the trafficking of weapons and drugs across international borders, the need for border security is at an all time high. By donning disguises and using pack mules to simulate smuggling drugs and weapons, the Troopers from the Horse Detachment, Regimental Support Squadron, 11th Armored Cavalry Regiment, provide training to counter the threat of smuggling for rotational training Soldiers on the fictional borders of Donovia and Atropia at the National Training Center, known as NTC, at Fort Irwin, Calif.
TARIN KOT, Afghanistan – Members of the Afghan National Army’s 4th Kandak, 205th Corp Medical Company, gathered at Multi-National Base Tarin Kot this week, to learn how to train their own in medical evacuation. Referred to as train-the-trainer, 25th Combat Aviation Brigade crew members, along with Slovak, Australian and U.S. Army mentors, guided ANA soldiers through a three-day course allowing them to travel to forward operating bases and train Afghan medics on medical evacuation procedures in the future. “The students are already trained in first-aid and medical care, but most of the soldier’s have not gone through any medevac procedures,” said Chief Warrant Officer 2 Gary Ralstin, medical mentor for the Operational Mentor and Liaison Team- 2. FORWARD OPERATING BASE GERONIMO, Afghanistan (May 3, 2012) — “Shana ba shana” is a Dari saying that Sgt. Christopher Scott has heard since he arrived here in December 2011. The saying translates to shoulder-to-shoulder. Afghan forces say it’s a way to describe someone’s work ethic and shows the effort they put in with others. For Scott, a logistics advisor with the Embedded Training Team, 2nd Battalion, 6th Marine Regiment, it means taking a night off from the gym to spend time with his Afghan allies. “I’ll take my personal time to come over and hangout, watch television and just talk to them,” said Scott, from Ogdensburg, N.Y.
About once a month Scott sits down with the Afghan soldiers he trains and serves alongside with to eat a meal and drink chai tea. Sometimes it’s only Scott. Other times it’s an entire squad of Marines. KUNAR, Afghanistan – The Kunar provincial courthouse was the scene for a public corruption trial today in which two men were accused of embezzling food from the government. Habib ullah Jangay, Khas Kunar Chief of Police, was charged with misuse of his position, and Shams urhman Momand, a logistics officer, was charged with corruption. The two men were accused of skimming food which was to be delivered to police officers as part of a government contract. They were accused of taking the food home for their own use and selling the excess. Despite several outbursts during the trial, Qazi Muheebullah, city court chief, was able to keep order in the court. He stated the importance of holding the trial publicly to promote transparency in the judicial process. METHAR LAM, Afghanistan – After nearly seven years of working with the local community in the Laghman province of Afghanistan, Provincial Reconstruction Team Laghman is closing up shop and handing the reins over to the Afghan people in the district. USAF civil engineers Capt. Hans Winkler of the 633rd Civil Engineer Squadron, Joint Base Langley-Eustis, Va., and 1st Lt. Jasamine Pettie of the 60th Civil Engineer Squadron, Travis AFB, Calif., conduct inspections of Afghan building projects in Laghman province, Afghanistan, 4.19. 2012. The engineers are deployed to the Laghman PRT, tasked to help increase local government infrastructure in the Laghman province. The PRT was stood up in 2005 and made up of a number of airmen and soldiers that filled a variety of positions to help complete their mission, while continuing to be a self-sustaining unit. PRT Laghman’s mission was to help build governance and stability in the Laghman province by working with government officials to facilitate better lines of communication and working relationships within the Afghanistan government, said 1st Lt. Timothy Ramig, Information Operations and Public Affairs officer for PRT Laghman. WASHINGTON, May 1, 2012 – After joining Afghan President Hamid Karzai in signing a strategic partnership agreement in Afghanistan’s capital of Kabul today, President Barack Obama took to the airwaves at Bagram Airfield to update the American people on the mission in Afghanistan. The speech from the large NATO base about 35 miles from Kabul was the last event of an eventful night that saw the president fly in to Afghanistan, sign the agreement and meet with American service members. Bagram is the headquarters for the International Security Assistance Force’s Regional Command East, and is an outpost for the war on al-Qaida. Obama said it is important for Americans to remember why U.S. service members are in such a place. “Here, in Afghanistan, more than half a million of our sons and daughters have sacrificed to protect our country,” he said. LAGHMAN PROVINCE, Afghanistan (4/30/12) – Soldiers of the 236th Engineer Company from the Texas National Guard presented certificates of completion to 11 Afghan National Army soldiers assigned to the 1/201st Engineer Corps for completing maintenance training at Forward Operating Base Gamberi, March 24. “I am able to teach others what I have learned now, and we are happy they have trained us,” said ANA Sgt. Abdul Jala, a sustainability engineer with the 1/201st Engineer Company. Afghan National Army soldiers from the 1/203rd Engineer Corps trained for several months with the Soldiers assigned to the 7th Engineer Battalion at Forward Operating Base Gamberi. “Our way forward now is to let these ANA soldiers go out to their units and reassess their skill level and see how well they retained the information taught,” said Army Staff Sgt. Michael Harvel, the maintenance noncommissioned officer in charge with the 236th Engineer Company. The Afghan National Army's first major operation this spring has resulted in the clearance of improvised explosive devices from a 25-square-kilometre area and the recovery of three weapons caches. Operation SHAFUQ (which means 'dawn' in Pashtu) is a large-scale Afghan National Army (ANA) operation to clear the Bowri Dashte area of Nad 'Ali. The operation was conceived, planned and executed by the ANA, with on-the-ground advice provided by British soldiers. FORWARD OPERATING BASE ZEEBRUGGE, Afghanistan — Key commanders of Afghan and Marine forces took a tour of a vital partnered position in Kajaki, April 20. Captain Joshua B. Kling, commanding officer of Golf Battery, 2nd Battalion, 11th Marine Regiment, inspects the post here, April 20, 2012. Marine and Afghan National Army officials toured the observation post, which is the northernmost Marine position in Kajaki. Brigadier General Abdul Wasea, commanding general of 2nd Brigade, 215th Corps, and Colonel John R. Shafer, commanding officer of Regimental Combat Team 6, inspected the position and talked to Marines and Afghan National Army soldiers at Observation Post Shrine. OP Shrine is the northernmost Marine position in Kajaki. It occupies the high ground along the northern side of the Helmand River, preventing insurgent forces from crossing the river and moving south. The commanders asked the Marines and soldiers about the post and what it is like for the men serving there. 4/30/2012 - KABUL, Afghanistan (AFNS) -- In the difficult-to-traverse landscape of Afghanistan the MI-17 helicopter has proven to be a valuable asset to air operations in the war-ravaged country. The aircraft has proven itself in missions ranging from supplying distant outposts to providing overwatch for coalition forces. Operating in such rigorous airspaces places a tremendous physical toll on the helicopters and demands a thorough maintenance regimen. Advisers from the 442nd Air Expeditionary Advisory Squadron have been assisting Afghan maintainers in their goal of keeping the MI-17s mission operational. Air Force Master Sgt James Ashcom, a helicopter adviser with the 442nd AEAS, said the Afghans are doing a great job of taking care of business. "I found that the Afghans are very motivated and they are very good mechanics," he said. "When you empower them to do something they will take great pride in it and will not fail." The Pensacola, Fla., native said that the Afghans do roughly 95 percent of the maintenance work unassisted and advisers usually only get involved with the more complex and unique maintenance operations. He said the Afghans have been doing top-notch work. "I have inspected the whole fleet and haven't found anything I'm scared of," he said. "I would not hesitate for a second to fly on any of their aircraft that they have worked on." The sergeant said that some of the main issues are supply issue with parts and a communication barrier with the technical data. There are currently only English and Russian versions of the technical data which is indecipherable to the majority of the Afghan mechanics. Some of the training has been accomplished in a traditional classroom setting. Air Force Master Sgt. Charles Jenkins, a 442nd AEAS plans and scheduling, maintenance operations center and mission debrief adviser, has been busy teaching the Afghans about fleet management. He said they have been great students. "I don't see a difference in teaching here besides a lack of some resources," he said. "They want to see their country succeed and I can see it in their eyes every time I teach them." The Baltimore native said showing them how to balance maintenance and operational needs for the aircraft is important. He said it is a great feeling to see a student's face light up when they solve a difficult problem. If flight hours run out for an aircraft and it has to be grounded for maintenance it can have dire operational consequences. Jenkins said he tries to impress on his students to avoid that risk. "Do not ground the fleet, you need to have enough hours on the aircraft to accomplish the mission," he said. "Once they learn it they run with it. When I see someone get it that is a great reward." Afghan air force Maj. Azizullah Mojer, weapons and ammunition commander at Kandahar, said that he appreciates the hard work the advisers do in helping the Afghans improve. "The advisers are my friends and they are like brothers to me," he said. "Maintenance is very important, because without it you can't fly the aircraft. It's rewarding to do a good job on some of the hard missions." Master Sgt. Marcus Wiggins, 442nd AEAS weapons adviser, said he has enjoyed his time with the Afghans. He said they are becoming more independent every day. "Overall they are getting to the point where they are self sustained, although there are still some areas that need some work," said the native of Lewiston, Idaho. "They definitely have a bright future. They just have to continue using the processes that we are teaching them." KANDAHAR AIR FIELD, Afghanistan — Surrounded by the debris of previously detonated objects, students from Camp Hero’s Afghan National Security Forces Explosive Hazards Reduction Course climb out of their truck with mine detectors. Walking on either side of their vehicle, the Afghan National Army soldier and Afghan Uniformed Policeman check the immediate area to ensure a safe dismount for the rest of their team members. Afghan servicemembers recruited from across Regional Command South, Task Force Paladin and their Afghan counterparts at Camp Hero comprise the four-week EHRC to train and improve ANSF capabilities in identifying and removing the threat of explosives. “These guys are going to be filling empty spaces in EOD units,” said Army Capt. Benjamin J. Beck, EOD partnership officer in charge, Task Force Paladin South. There are 30 students split into three groups, he said, with two Afghan and two Australian instructors. Around the perimeter of the training site, four of the students patrol to ensure 360-degree security around the vulnerable area. The second student, an Afghan Uniformed Policeman, drags a long rod called a gaff, staring intensely at the ground in front of him and his team. “Right now they’re dragging for command wire, checking to make sure the safe area is secure,” Beck said. Having spotted something suspicious at the curve in the road ahead, the students must ensure every precaution is taken for the team going in to identify the area. “By mid-to-late summer, we believe instruction of the course will be entirely Afghan-led,” he added. Walking 100 meters towards the possible IED, students approach with caution and mine detectors. When the lead student arrives at the suspected device, he carefully sets the detector behind him and lies on his stomach. Using exact and modest movements, he pulls out a mine probing tool and begins the process of loosening and brushing away dirt and sand covering the device. The process is long, taking concentration and a delicate hand. Eventually, each brush begins to expose shades of orange beneath the loose earth. It is a jerrycan, or bushka, a large steel container that can hold about 20 liters of fuel, buried in the ground and ready to detonate as the team’s vehicle came around a bend in the road. Dropping markers near the IED, the soldier slowly pushes himself up, carefully retrieves the mine detector and makes his way back to report to his team. The training is designed to teach Afghan forces to recognize and identify hazards in things that appear normal and to understand proper precautions. In every nation and every service, EOD teams are elite because of the dangerous and specific nature of their jobs. All service members are taught about explosives and the dangers, but there are few that can take care of that threat. The EOD soldier, an ANA commando, makes his way to the jerrycan IED, sweeping carefully with the mine detector, keeping an eye out for the brightly colored markers his team places. Following the same procedure of efficient, careful movements, the EHRC student lays down, face-to-face with the orange explosive. He brings out detonation cord and C4 to blow the IED in place, so that the team can move on with their mission. After initiating the process, he moves back to his team. The commando has three minutes before the blast. The puff of dust and pop of the detonation lets the students and instructor know that their training exercise was a success. With the groups finished, instructors gathered them in the classroom – a building filled with examples of mines, rockets, IEDs and posters outlining the training techniques that are their lifeline. In here, instructors talk about their final week; the upcoming exams, life after the course and who would like to come back for further training to become an instructor.